Left to right: Gladious carneus, a dainty allium, Romulea rosea, camassia, Phaedranassa cinerea, Stenomesson miniatum, Gesneria cardinalis, calanthe orchid, Albuca candadensis and spiloxene. When spring bulbs are mentioned, most people think of daffodils, bluebells and tulips. But when they have been and gone and all that is left is the scruffy foliage, there are the late spring bulbs coming into flower. Most of these are less well known and certainly less celebrated in literature and art. For all that, they are often more interesting, maybe because they are unexpected. We love bulbs here and with bulbs I include corms, rhizomes and tubers. More than any other type of plant, they seem to mark the passage of the seasons and to create the smaller, detailed pictures that add layers of interest to the garden. Maybe because the perennials and annuals are coming into their own at this time, the late spring bulbs are often ignored and therefore harder to source. I headed out to the garden to see what was coming into flower. Discounting the earlier bulbs which are still flowering but well past their peak (veltheimias, the late lachenalias, Hippeastrum aulicum and the like), I found about 20 different types of bulbs coming into their own and that is by no means complete. There is little which is duller than endless lists and plant descriptions so I lined a number up for photographs. I featured the rhodohypoxis in Plant Collector a fortnight ago. These are relatively common and form attractive carpets in pinks, whites and carmine red with their mass of star flowers. There is nothing rare or exclusive about Soloman Seal (Polygonatum multiflorum) either. It was common in the gardens of grandparents and is perhaps undergoing a surge of discovery amongst newer generations of gardeners. It is particularly handy for semi shade positions and, after battling a near impenetrable mass of entangled rhizomes, I decided it may well have some merit as a natural stabiliser for an eroding bank. I will report back in three years about the success or otherwise of this venture but as it will grow pretty much on top of the ground and grip hard, I am optimistic. As a bonus, the foliage turns golden in autumn – an unexpected source of autumn colour for us. For sheer exotica, it is hard to beat Hippeastrum papilio which is just opening. Papilio means butterfly though I think it is more orchid-like really. This is a spectacular bulb from Brazil which is offered for sale from time to time. It is more expensive than rare. We had to try a couple of different places in the garden before we found a spot where it was happy but we now have it thriving in open woodland conditions. While on the big bulbs, Scadoxus puniceusis one of our showiest but I won’t dwell too long on it because it is rather too frost tender for inland areas and rare in this country. Its cousin, Scadoxus katherinae, is a better bet for frosty areas because it is dormant in winter and doesn’t start moving until spring, flowering in summer. Similarly, our love affair with the arisaema family (sometimes called snake’s head lilies though they aren’t lilies) is of limited value because our showiest ones are Mark’s hybrids which we have never sold so they can’t be seen anywhere but in our garden. Given time, we may put them on the market but that is a way off. Most of the arisaema family hide their flowers below the foliage but Mark has managed to breed with varieties to bring out the desirable trait of holding their flowers above the leaves, making them much showier as well as being easy garden plants. You may, however, find Arisaema speciosum which is easy to grow and Arisaema ringens is relatively common. If you have a bank that you look up to, the flowers are little more obvious without having to part the leaves to see them. We describe A. speciosum as the closest thing to a cobra you would want in the garden. If you are getting frustrated trying to find more unusual plants, there are good reasons why. Many if not most of the specialist nurseries throughout the country have closed down over the last decade as have most mail order nurseries. Treasure the ones that are left because there are few new plant businesses opening. However, bulbs are perhaps a little easier than trees and shrubs and I occasionally look at the bulbs section of Trade Me and see some interesting and less common material offered for sale there. Beyond that, you may have to start haunting your local horticultural society or keen gardening groups where there are likely to be one or two people who know their bulbs from their onions. This entry was posted in Abbie's column and tagged Abbie Jury, gardening, Hippeastrum papilio, Scadoxus puniceus, spring bulbs, Tikorangi: The Jury garden, unusual bulbs on 2 November 2012 by Abbie Jury. The bulb wonderland of southern Africa gives us this mid to late spring flowering treasure from Natal. Scadoxus puniceus is not often seen in the country and rarely offered for sale but well worth having if you find it. The bulbs are large fist-sized affairs and slow to increase, but if you find somebody with a plant, it sets seed and as long as you are working with fresh seed, it germinates readily. Usually the flower stem appears first in late winter, followed soon after by the lush pale lettuce green foliage. The relatively large flowers consist of a mass of orange stamens surrounded by a maroon outer petal casing, which is not a common colour combination in any plant. It is happy in woodland or semi shade conditions which never get hot and dry in summer or cold and wet in winter. The former will force it into early dormancy whereas the latter will rot out the bulb. 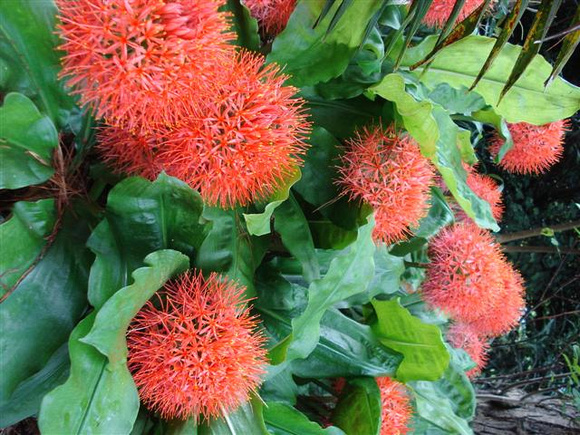 It is the same family as Scadoxus multiflorus ssp. katherinae which is far more readily available. Katherinae has large spherical flower heads in red which look like a mass of spidery stamens and runs about three months behind puniceus. It is just coming into growth now and will flower in mid to late summer making a real feature in the summer garden. This entry was posted in Plant collector and tagged Mark and Abbie Jury, Scadoxus puniceus, The plant collector, Tikorangi: The Jury garden on 28 October 2011 by Abbie Jury.